This is a 4″ to 20″ tall, erect, perennial forb that rises on usually several stems from a robust root system. The stems are erect or ascending, stout, freely branched, reddish, and covered with two kinds of hairs. They are densely covered with short, white, soft, matted, woolly hairs (tomentose). They are also sparsely covered with long, white, soft, unmatted, shaggy hairs. Basal leaves are on long, tomentose stalks. 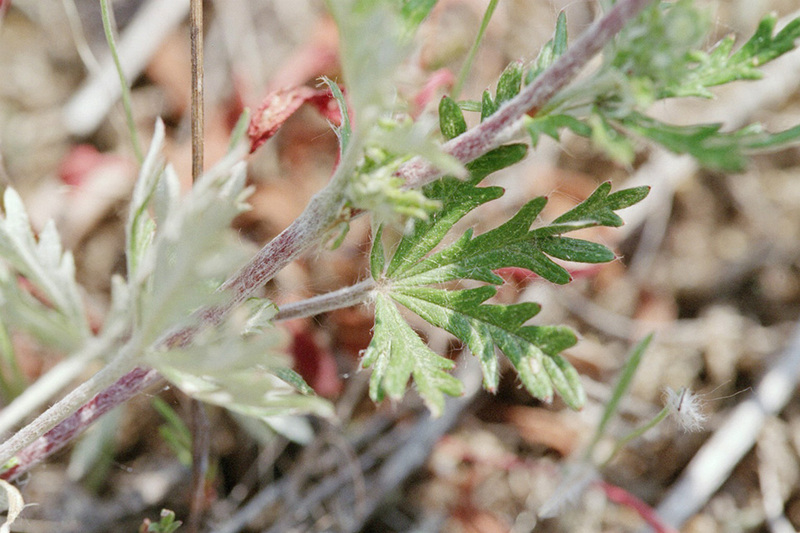 The are ¾″ to 4″ long including the leaf stalk, and are palmately divided into 5 leaflets. The leaflets are ⅝″ to 2″ long, though usually no more than 1¼″ long, and 3 ⁄16″ to ⅜″ wide. They are narrowly inversely lance-shaped or narrowly inversely egg-shaped with the attachment at the narrow end. The base is wedge-shaped, triangular, and tapers to the leaf stalk. The upper surface is green and covered with long, soft, straight, appressed hairs. 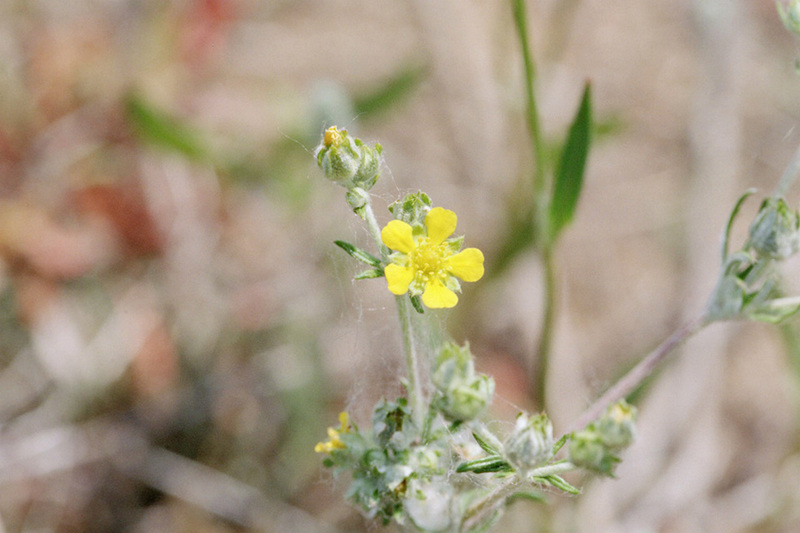 The lower surface is densely white tomentose. Neither surface has glandular hairs. The margins are untoothed below the middle and have 2 to 5 teeth above the middle. The teeth are linear or narrowly oblong and cut ⅔ of the way to the midrib—they could be considered secondary lobes. The margins of these teeth/lobes are rolled backward toward the underside. 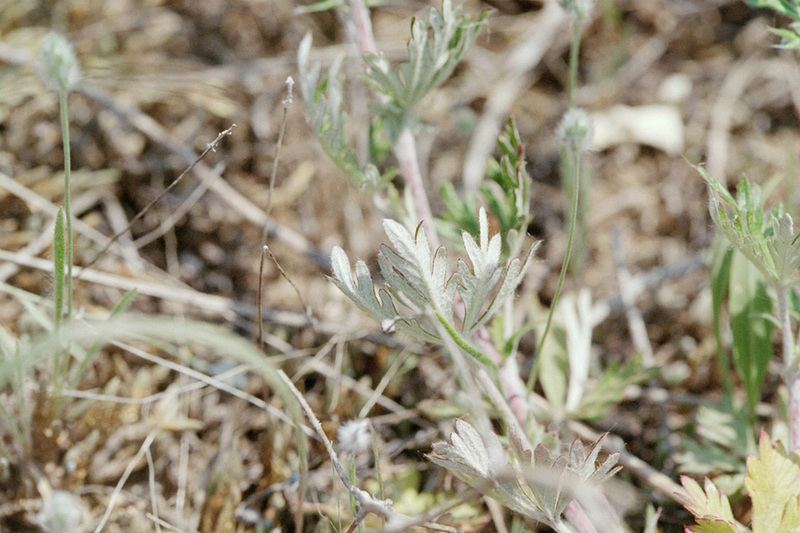 Stem leaves are many, alternate, and similar to the basal leaves, but with leaf stalks getting progressively shorter as they ascend the stem. Upper stem leaves are stalkless. 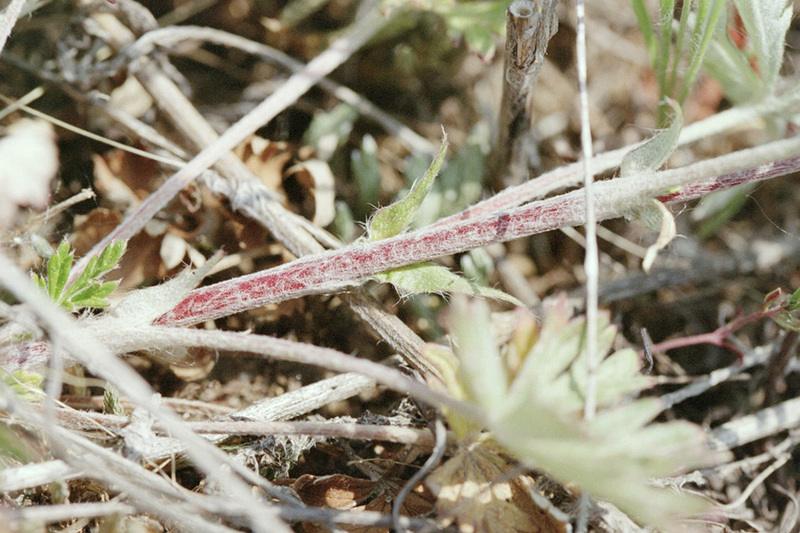 At the base of the leaf stalks is a pair of small, leaf-like appendages (stipules). The upper side of the stipule is green, the lower side white tomentose. They are unlobed, pointed at the tip, and may have 2 or 3 deeply cut teeth on each side near the tip. The inflorescence is a loose, open, branched cluster of many flowers at the end of the stem. The flowers are ¼″ to ⅜″ wide. They are borne on ⅝″ to 1″ long, tomentose flower stalks. 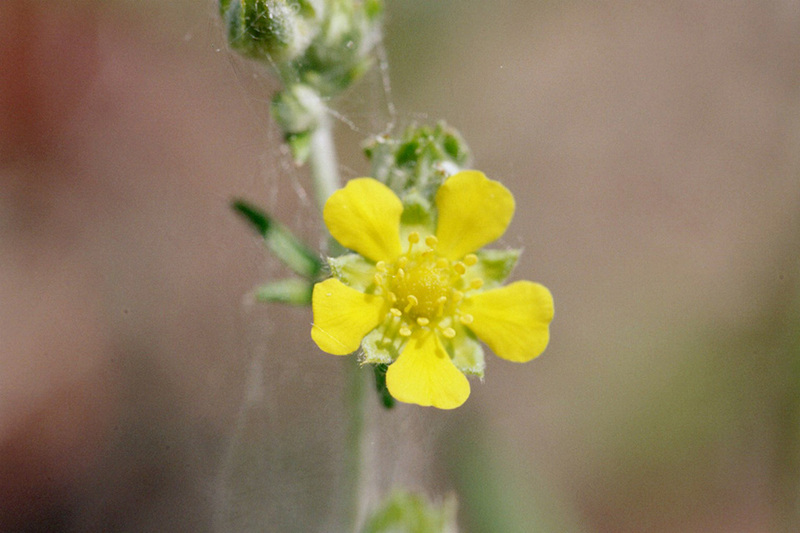 The 5 petals are yellow, inversely egg-shaped, notched at the tip, and tapering to a narrow, wedge-shaped base. 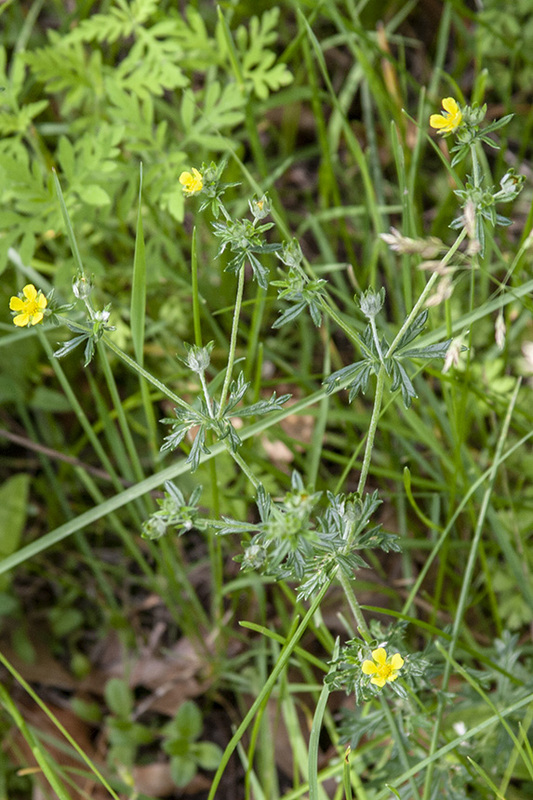 The 5 sepals are green, shorter than the petals, and alternate with the petals. The 5 bractlets are shorter than the sepals when the flower is fully open. They alternate with the sepals and are hidden below the petals when the flower is viewed from above. There are 20 stamens with yellow anthers. The style is visibly thickened at the base. The fruit is an achene. 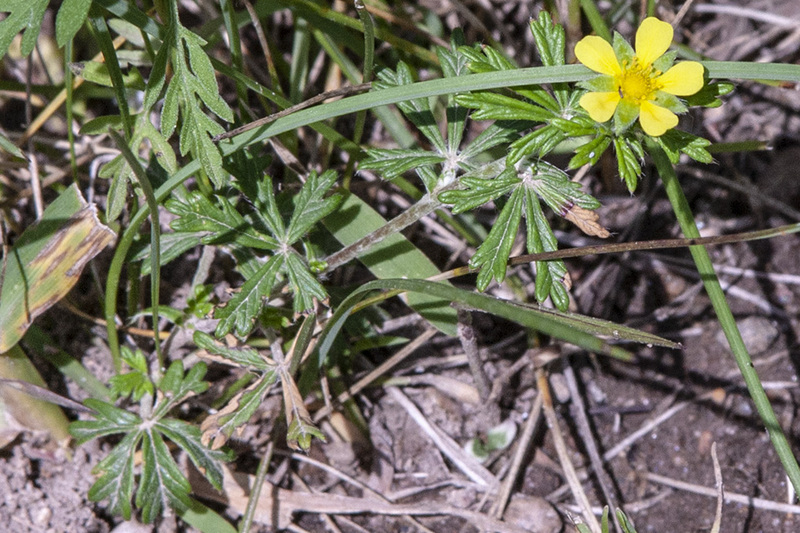 Tall cinquefoil (Drymocallis arguta) stems are erect and unbranched below the inflorescence. The leaves are pinnately divided into 7, 9, or 11 leaflets. The petals are yellowish-white, cream colored, or nearly white. Densely covered with short, soft, matted or tangled, woolly, usually white or silvery hairs. 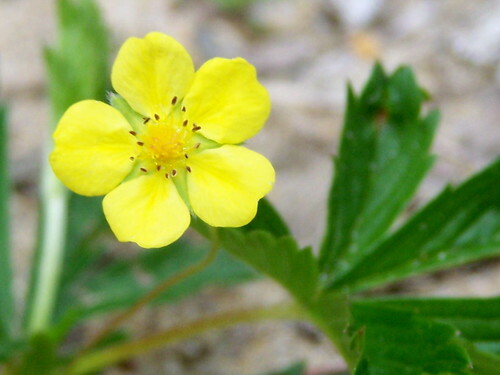 De Viltganzerik (Potentilla argentea) is een in België en Nederland in het wild voorkomende plant in het geslacht Ganzerik. In oudere boeken wordt de plant ook wel zilverganzerik genoemd, wat de vertaling is van de botanische naam, en wat ook overeenkomt met de Duitse naam Silber-Fingerkraut en het Franse Potentille argentée. In Friesland wordt de plant Wollich sulverblêd genoemd.